Apple on Tuesday began sending emails out to members of its development community, offering them the opportunity to have a 42-millimeter Apple Watch Sport shipped no later than April 28. The Apple Watch model being offered to developers comes with the silver aluminum case and with a Blue Sport Band. The offer was first noted by Twitter user Amro Mousa on Tuesday. Developers will be selected for the offer at random, and they must register between now and April 23 and 10 a.m. Pacific. Those selected will be notified this Thursday. A day later, the Apple Watch will officially become available and begin arriving on the wrists of consumers. Availability at launch has been extremely limited, and sold out in a matter of minutes when preorders began earlier this month. Currently, new Apple Watch orders for most models are scheduled to arrive in June. The limited offer from Apple will help to ensure that some developers will have the hardware, and will be able to test their apps, before most consumers get the opportunity to try the wearable device. 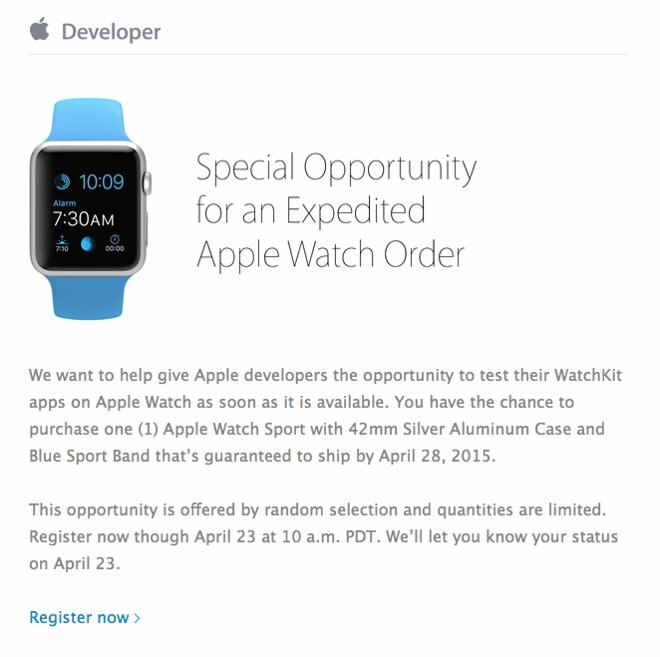 Those selected will receiver their Apple Watch no later than four days after the device becomes available. Apple is currently preparing initial Apple Watch orders for shipment, and began charging some customers for their preorders on Friday.